If you have a soft spot for all things sweet and delicious with some incredible rewards thrown in for good measure, then Sundae Bingo will be the perfect bingo site for you. At Sundae Bingo, you can treat yourself with a range of exciting games and promotions to help you boost your bankroll and your gaming experience. Sundae Bingo is the sweetest bingo site around, offering a delicious array of 75-ball and 90-ball rooms to please all fans. In addition, you can tuck into over 300 slot games as well as some exciting promotions and special offers, including an incredible rewards programme for dedicated players. Let’s find out more about this impressive and unique bingo brand. As a new member at Sundae Bingo, you will have a chance to earn some quality bonuses in the form of free bingo tickets and free spins when you make your first deposit. Once you have signed up to the website, you can claim £70 worth of bingo tickets plus 10 free spins when you make your first deposit. All you have to do is make a minimum deposit of £10 to claim your bonus, which is split into £30 on Street Party and £40 on Big Bang, while the 10 free spins are available to use on Fluffy Favourites. Be sure to check out the terms and conditions of the bonus before you make your first deposit. On top of the new player bonus, there are additional promotions and special offers available to registered players, including opportunities to win 50 daily free spins, monthly cashbacks and VIP status. Sundae Bingo is a good-looking site that is easy to use, and easy on the eye. The theme is, of course, ice-cream, which is evident in the pastel colours and imagery throughout the site. The interface is easy-to-use, making navigating a breeze, seamless and stress-free. The entire site is very neat and well-organised, from the layout to the games lobby. There is a handy search function to help you quickly find your preferred games, while the heart icon allows you to store all your favourite games in one convenient place. If you want to spice things up, use the question mark icon, which chooses a game for you at random. As a leading supplier of bingo games, the website makes use of the Dragonfish bingo software, one of the biggest bingo software providers operating in the UK market. The brand provides hundreds of titles, such as bingo games like 90 ball, 75 ball, slots, table games, and live dealer games. 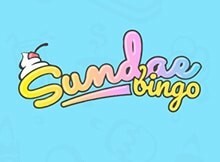 Sundae Bingo is a brand new site, having been launched in 2018 by Tau Gaming. The website makes use of the Dragonfish bingo software. Of course, Sundae is ultimately a bingo site, so expect plenty of top-class games worth checking out. While there may not be as many bingo rooms as other websites, Sundae still has an impressive selection available, with 70-ball and 90-ball games leading the pack. Games run regularly and every few minutes, so if you miss one, just catch another. Prices for games also vary, but generally suit all budgets, starting from completely free to up to £1. If you are in a lucky mood, you will be happy to know that some rooms have some exciting progressive jackpots as well. As mentioned above, Sundae Bingo is home to over 300 online slot games, which is rather impressive. If you are looking for variety, the Sundae Bingo is the place to be. On top of online slots, you will also find a fair selection of casino games and scratch cards, all powered by some of the biggest names in the industry, including NetEnt, NextGen, and Thunderkick. Some of the most popular titles to keep your eyes out for include Da Vinci Diamonds, Love Island Slingo, Cosmic Cash and more. If you fancy some table games, check out Roulette, Blackjack and baccarat variations to suit all preferences. And when all else fails, the selection of scratch cards will no doubt add a touch of excitement to your gaming experience. When it comes to safety and security, Sundae Bingo reigns supreme. Banking is easy and convenient at this top-class gaming platform. The site accepts all the most popular and reputable banking methods, including PayPal, wire transfer, Neteller, Paysafecard and Entropay. There is also the option to deposit by phone. For withdrawals, expect a wait period of a minimum of two days and a maximum of ten days, depending on what method you are using. At the moment, Sundae Bingo does not have any mobile apps that can be downloaded, but this shouldn’t be an issue as its website is highly responsive and available instantly via your web browser. The website is optimised for mobile play, so expect a smooth and seamless gaming experience while on the move. The mobile version is identical to the desktop site, with everything laid out in a user-friendly manner, making it ideal for players of all skill levels. Sundae Bingo may be new to the online bingo world, but it has so much going for it. The bingo selection is indeed impressive, while over 300 slot machines make it one of the biggest selections we have seen. While the casino games portfolio is not that huge, we’re sure it will grow in the future as the website gets bigger. Overall, the bingo site delivers some exceptional gaming opportunities no matter what your preference, while generous promotions will keep you coming back for more. The website is neat and clean and very visually appealing, making Sundae a sweet addition to your gaming activity. New players also stand a chance to bag a great bonus when you make your first deposit, while friendly and proactive customer support agents are on call to assist with any issues you may have. A friendly and welcoming bingo site that offers something new and refreshing to the market. For instant help: Log in to your account and go to the help room where there are agents on standby to help (available between 10am – 2am), to assist you with any questions you may have and all queries will be answered within 48 hours.